This is a home in Rancho Santa Fe, in the adobe mexican style. The client wanted a warm inviting entrance, we decided to stain the concrete and I painted a carpet like design on the concrete with doves. The project was to do a replica of the Mexican Virgin Lady of Guadalupe from the the original painting. Gold leaf accents on the gown and rays, old world patina, hand painted on wood. With designers Porter Interior Designs we took some liberties and added some roses. The frame was specially made for the painting. I am inviting Catherine Segura Friday 12th May between 11:30am-5pm. She will be doing Tintypes Portraits at L’Atelier (2655 Reynard Way, Mission Hills, San Diego, CA 92103). It’s really neat experience, you get to learn how it was done in the 1800s, hold still! And see your picture being developed on site using all the old techniques. Tintypes are for $45 each. 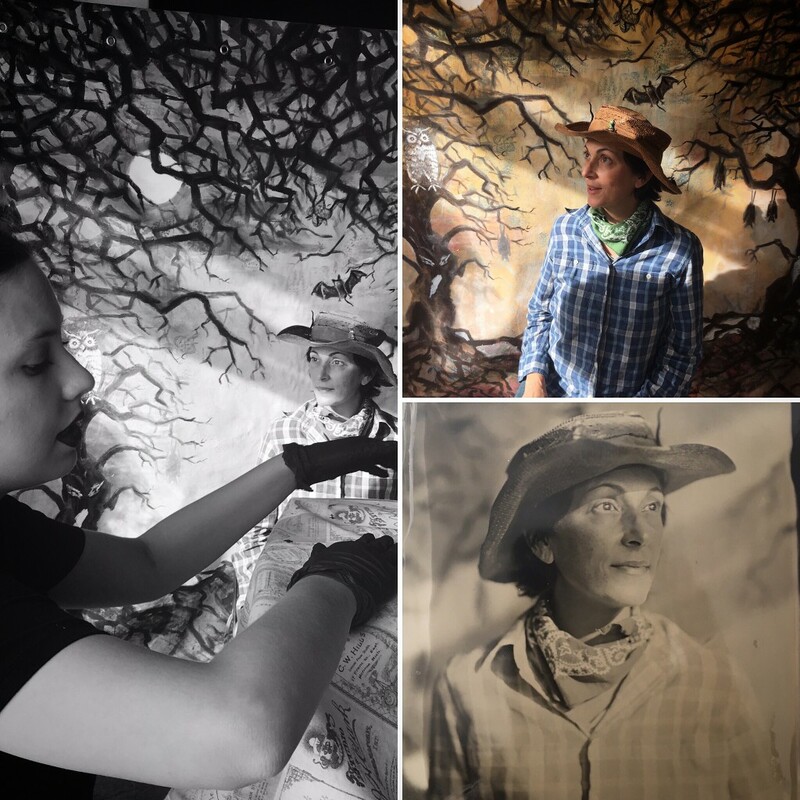 Monday 31st October, Photographer Catherine Segura (C.A.S Photography), brought her 1864 lense to L’Atelier and I painted a Halloween backdrop for the occasion. Clients had a chance to see the magic and wonder of the wet plate process, the first photo technique. Catherine developed the photo on site, you got to go home with a unique framed tintype of yourself. We had so much fun I think we are going to do this regularly. I want to thank the Mission Hills neighbors for coming by and taking a chance! 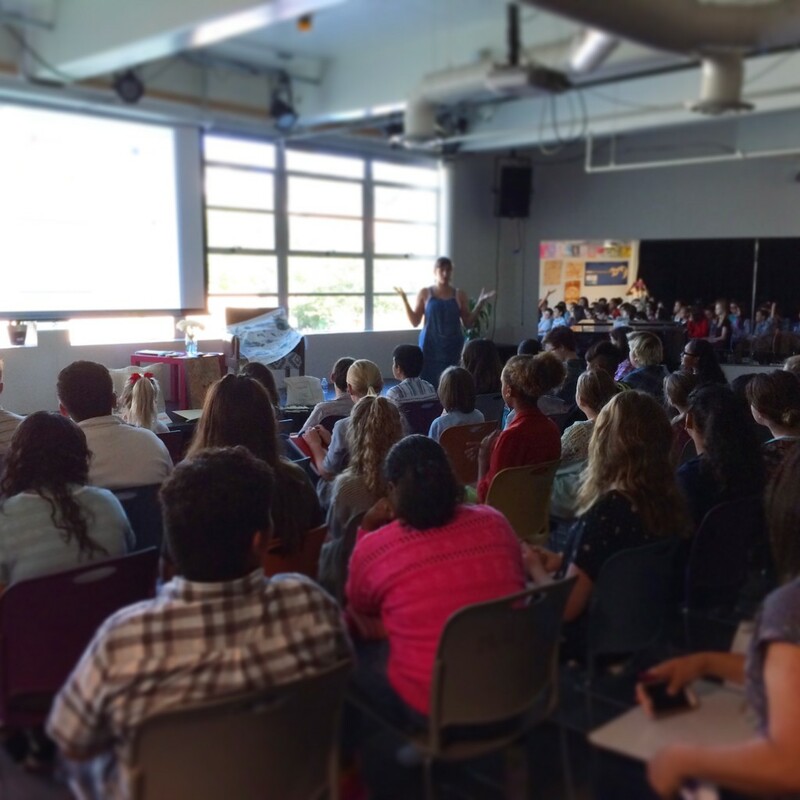 Talked to schoolers today about the ins and outs of product design at high Tech High in Point Loma. Teaching them how to come up with ideas, the importance of social media, keep it simple, practical and work on your budget. I will be going back in 8 weeks to see what they have come up with and guide them for their ultimate success. They also be selling their goods on Ray Street in North Park in November this year. The Painter Genie has moved! 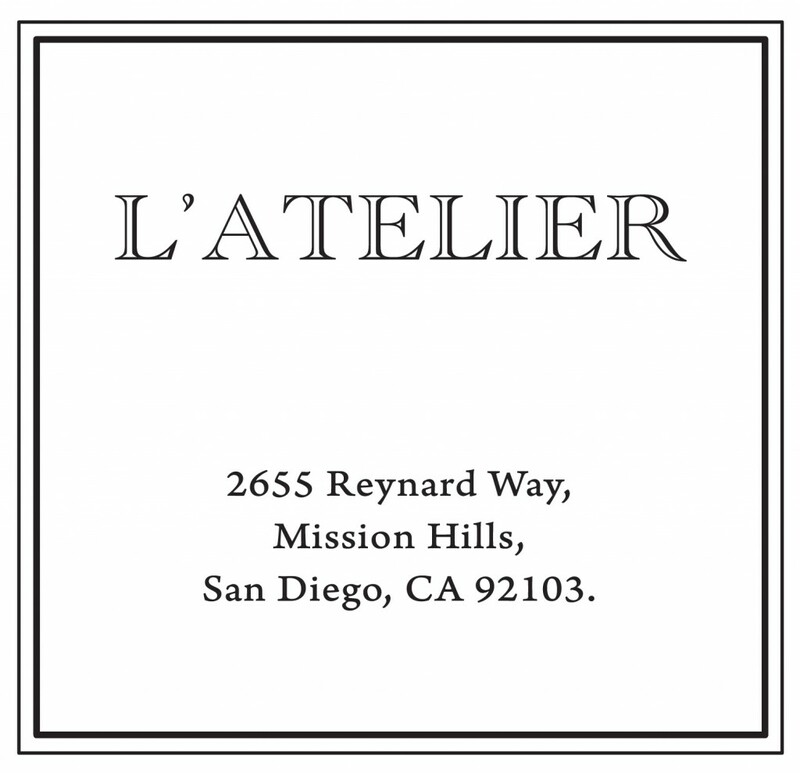 L’Atelier is Valentine Viannay art studio, based in the business district of Mission Hills, San Diego. The space is also used as a permanent art gallery where you can buy Valentine ‘s work and other local artists. Classes are available throughout the year with Valentine, the showcased artists and interior designers. You can learn techniques from professionals like silkscreening, dyeing fabrics, engraving, monotype, interior designer’s tips, wall patinas, plaster finishes, gold leafing, wood and marble faux, jewelry, leather work, fine art drawing and painting. These classes are more geared for adults, 16 years old and up. If you think someone younger would benefit, please don’t hesitate to ask. I have always dabbled in jewelry making. My mother happens to be a reknown jewelry designer in Fracne and I grew up faffing in her shop. Here is a new line of brass bugs and other random objects. You are welcome to EMAIL me to order, they are $40 each, free shipping. Probably one of my favorite things to do is collaborate with designers but this time it’s with a museum store! I am making fun goods for their exhibition called Masters of Graphics opening on the 9th June 2016 at the Seattle Art Museum. Which is all about different techniques of printing and with a little luck it happens that my work is a perfect fit for their show. I am making scarves, totes bags and tea towels each one of a kind. The totes are made with recycled materials from my work table tarp. After a lot of use I dye it and print something a little like a small painting on each bag to make them unique. The scarves are also semi-recycled as the cotton jersey I use is from end of rolls from the LA fashion district. And the tea towels are USA made. Why not change the rules a little, instead of the usual family tree branches connecting each name and picture do something a little different? I was commissioned to painted a informal tree for a wall of family photos. It will be very subtle in the background of the photos but it still stand its ground. I used glazes to give the tree a translucent feel with a little shimmer in contrast to the flat surface of the paint finish. Copyright © 2012 Painter Genie .